PayPal has added a Pebble app to its impressive array of wearable apps, meaning that users can now pay for stuff straight from their wrist. The payments giant – founded by Tesla and SpaceX visionary Elon Musk – has already created apps for Android Wear and Samsung Gear smartwatch apps, so the addition of Pebble gives it the lion's share of the wearable market. The app enables Pebblers to pay in two ways for goods in the real world. They can “check-in to pay" or use a payment code in supporting stores, restaurants and businesses that accept PayPal. 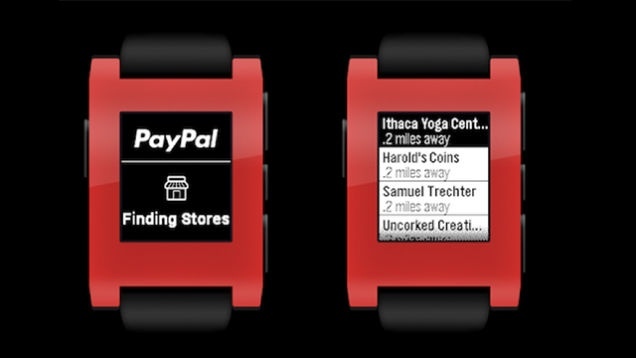 Serial eBayers will also be delighted to receive payment notifications from their Pebble smartwatch. This collaboration is another small step towards tech companies becoming big names in money. The news comes off the back of Apple Pay integration in the Apple Watch, Snapchat's new money-sending service and of course, Barclaycard's bPay band, which is being trialled in London for wearable tube payments.